We're one week out from Turkey Day, which used to be Grammy's main event. You're going to have to figure out how to roast a turkey on your own, because she didn't have a written recipe for that. She must have memorized it. In the mean time, this would be nice to have on the table. -Sift flour, sugar, baking power, soda and salt. -Cut shortening into mixture until coarse. -Combine orange juice, egg and grated rind. -Pour wet mix into dry mix and stir. 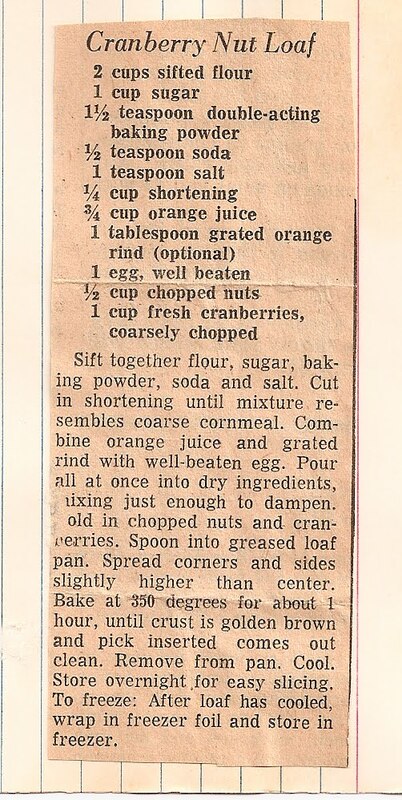 Add cranberries and nuts.